In our region of Central Florida we call them speckled perch or just specks, but in other parts of the world they are referred to as crappie. Call them what you like, speckled perch are great fun to catch and they make a mighty fine fish sandwich. Although crappie are a year round species, our speck season begins in October and ends in April. 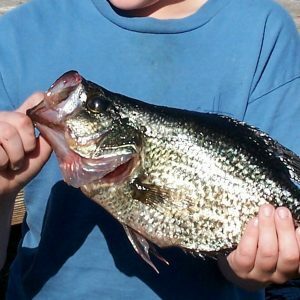 During this timeframe, crappie aggregate in schools in the big lakes of Harney, Jessup and Monroe in preparation of their spawning season. On my speckled perch charters we specifically target this species using ultra light tackle with a combination of slow trolling long lines and vertical jigging, and anglers are permitted to keep their fish. This is an old Florida family style of fishing where you just relax and enjoy your time on the water together.